The Minister of State (I/C) for Petroleum and Natural Gas Shri Dharmendra Pradhan today held meeting with Shri Devendra Fadnavis, Chief Minister of Maharashtra in Mumbai. They discussed all issues related to oil, gas, petroleum products, and the supply & marketing infrastructure in the state of Maharashtra. Shri Pradhan requested for various supports that ONGC, IOC, BPCL, HPCL and city gas development entities look for from the government of Maharashtra. The Chief Minister assured to consider the proposals expeditiously. 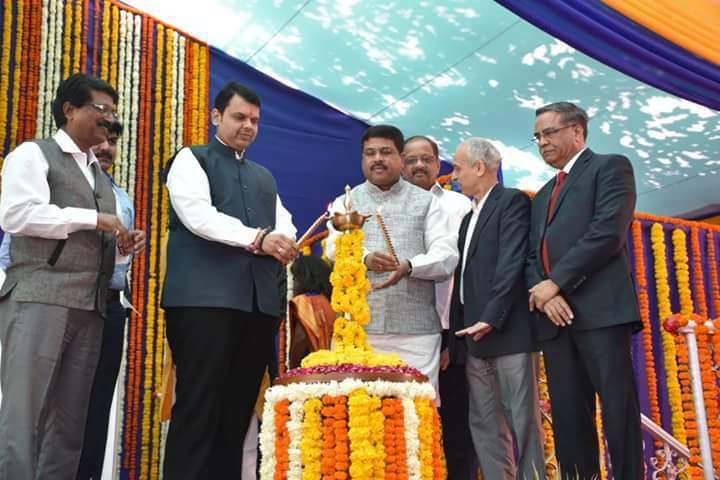 Shri Pradhan proposed that public sector Oil Marketing Companies(OMCs) would like to set up a new refinery in Maharashtra. This would be in addition to the two refineries of HPCL and BPCL(with combined capacity of 20 MMT) in the city of Mumbai. Maharashtra Chief Minister assured to extend all support including provision of land for this purpose. It may be noted that Maharashtra consumes about 18 MMT of petroleum products per annum which is going to increase in the coming years.